After a crazy couple of months and a move, we have finally settled into our new place and have managed to get connected again. I have also drastically changed my diet and approach to food but more on that in a future post. Prior to our move, the lovely team at Vetta pasta sent me a few samples of their new Smart Pasta range consisting of two healthier alternatives for pasta lovers - High Protein Low Carb and Cholesterol Lowering. Using the High Fibre, Low Carb spirals Pete and I made this delicious tuna pasta dish. It's super easy and super tasty. Heat a dash of olive oil in a heavy-bottomed pan and cook the onion, chilli, cinnamon and basil stalks on a medium to low heat for 5 minutes until onion has softened. Next, turn up the heat and add tomatoes, tuna and a good pinch of salt. Break the tomatoes up using the back of a wooden spoon, then bring to a boil and simmer for about 20 minutes. Taste for seasoning. 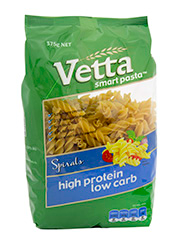 Meanwhile, cook the Vetta spirals in a pan of salted boiling water according to the pack instructions. When al dente, drain the pasta in a colander and reserve a little cooking water. Toss the hot pasta in the tuna and tomato sauce with the roughly torn basil leaves, another dash of olive oil, the lemon zest and juice and Parmesan ( if using). Mix together well. Add a little of the reserved cooking water if it gets too thick. Season if needed and sprinkle with crumbled goats cheese if desired. Looks tasty and congrats on your move!